What upsets you? Do you get upset if someone breaks a promise to you? Where does the upset come from? And how can you use outer experiences to learn more about what is going on inside of you? According to Wikipedia, psychological projection is a psychological defense mechanism where a person subconsciously denies his or her own attributes, thoughts, and emotions, which are then ascribed to the outside world, usually onto other people. Thus, projection involves imagining or projecting the belief that others originate those feelings. In other words, If You Spot It, You Got It. Think about it. You cannot experience a feeling if you do not have an actual inner experience of that feeling. Negative thoughts and feelings stem from judgments. For example, if you are upset because someone breaks a promise to you then you judge them as bad or wrong. 1) You exhibit the same behavior with others- do you break promises to others? 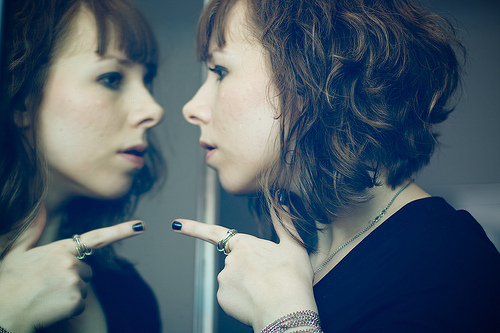 2) You exhibit the same behavior within yourself- do you break promises to yourself? 3) You can see yourself doing the very thing you are judging- would you break a promise to someone if something more urgent came up? 4) You trust the universe to provide for you regardless of what others may do- what is your trust level? Can you see that you cannot have a feeling without having a relationship with that feeling? Do you disown aspects of yourself and project them onto others? When you find yourself upset (judging) be aware that while you are pointing one finger at someone, there are three fingers pointing at you. This is an opportunity for you to take responsibility for your feelings, approach the situation in a more emotionally mature and calm way, be more compassionate with yourself and others, and cultivate better personal and professional relationships. The good news is that projections work both ways! If you experience someone as kind and joyful it is because you have the inner experience of kindness and joy. See the best in others (or at least not judge) and, in a way, you are really doing yourself a favor!